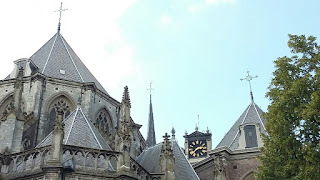 We sit here on our second day in Dordrecht listening to the cacophonous sound of the Grote Kerk's bells calling the Calvinist faithful to the 5pm service, while the rain storms sweep across with shots of sun inbetween. The lovely weather of the last week has let us down for a day, hence we are still here rather than on our way south as originally planned. The good weather is rumoured (sorry, forecast) to return during tomorrow when we shall progress down river and into the open water of Hollands Diep to Willemstad. 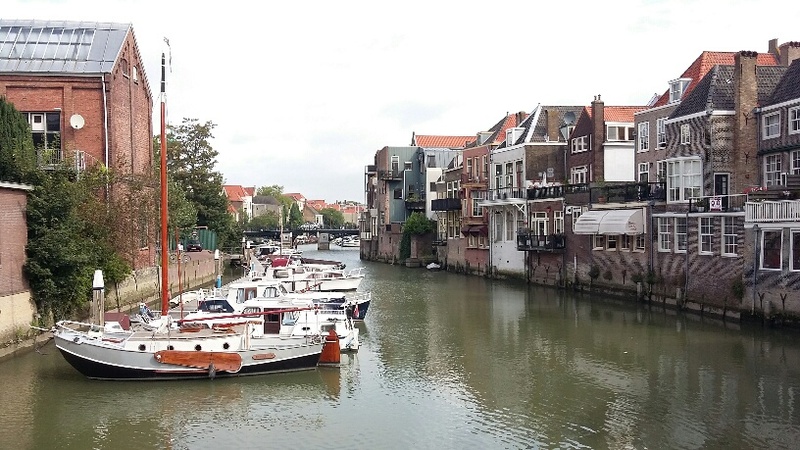 Dordrecht is beautiful wherever you go. Yesterday we went to lots of places after getting up early and doing two lots of washing. We're in the town marina which is perhaps 300m from the centre yet it is very peaceful ... despite constant comings and goings of infeasibly large motorboats through the small bridged entrance. 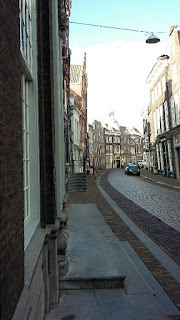 It seems the city, oldest in the Netherlands, is built on clay and many of the buildings have an alarming lean to them. The church tower was planned to be an impressive height but when they built it they changed their minds and stopped halfway. Het Hof, an old building which has been relentlessly modernised and which boasts the most expensive and all encompassing interactivity museum we have ever seen. It includes a lavish feature film with real actors which tells the story of the start of the Netherlands at the time of William of Orange. We were the only people watching, in August, in a museum which must have cost a million. The point of the film was to show a crucial meeting at Dordrecht which changed the course of Dutch history. The museum is a tad bombastic - all about Dordrecht and its place as a trading and shipping hub from the 1400s onwards. Our Combikaart museum ticket also allowed us to visit an art museum (again relentlessly modernised) which offered a lot of so-so local artists and a single Rembrandt. Streets are all cobbled, blocked and bricked. There is no tarmac. It's gracious, on a larger scale than chocolate-box Gouda and with few tourists. Most streets are very quiet. Each day we've had lunch onboard as it's not cheap eating out. Last night we went to a very small and very slow fish restaurant close by. The wait was worthwhile, for oysters gratinated with various Dutch cheeses, fried sole and delicious swordfish. We hit the shops to buy food and also looked in a few antique shops for a coal scuttle for home. We spotted an oak barrel with brass hoops which would work a treat. The surly dealer wanted 60 euros. We retired horrified. Later the same day, different shop, similar barrel ...15 euros! Result. It's been stowed in a locker. Today we had a much later start as the rain hammered down. L went to church ...to the Grote Kerk very close to the boat. It was a mistake. 2 hours of Calvinist Dutch service, no english translation and not an idea what was going on! Impressive building though. Talked to another British yacht, very rare to see one. They are doing same route as us but opposite direction. Have had similar frustrations with waiting for locks ... oh good! Went to third museum on combi, large house of rich collector, for once not modernised but as when he died in 1921. Combi ticket supposed to be only one day, we played the innocent, thought it was w/e, how could we do three in one day, smile ... and the nice lady let us in. Very enjoyable. Refused the siren call of their cafe and scampered back to the boat. Later the weather improved and we had a stroll around old streets and waterfront, almost deserted. Perhaps it is the end of holidays here for the Dutch and they are back to work tomorrow - poor them.